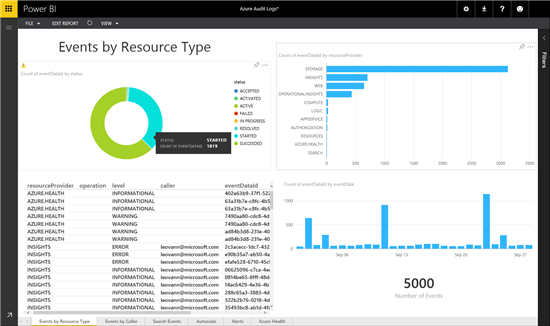 Azure Audit Logs allows you to view control-plane operational logs in your Azure subscription. 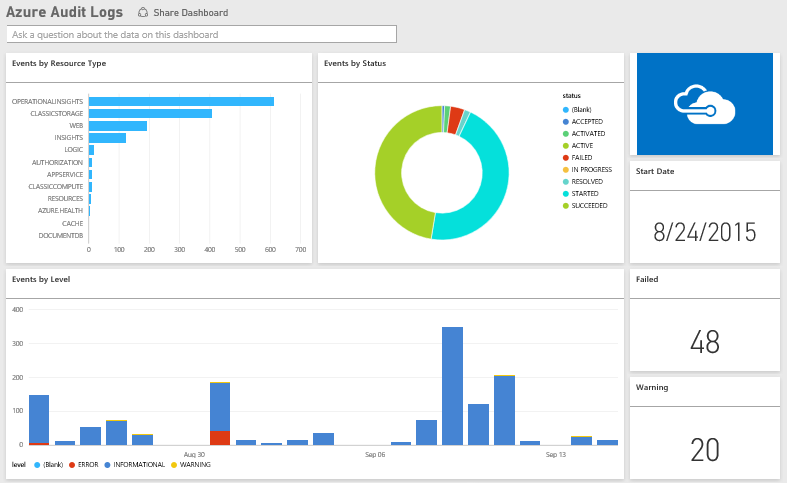 The Power BI Azure Audit Logs content pack can help you easily analyze and visualize the wealth of information contained in these logs. The content pack allows you to connect to your data and begin to discover insights with the out-of-the box dashboard and reports. To get started you will only need your Azure subscription ID and credentials. For additional details on how to connect, please see the Azure Audit Logs content pack for Power BI help page. Connecting through the content pack is easy and once you have, a dashboard will be automatically instantiated. This dashboard includes a set of tiles, each of which provides insights on a specific operation or event. Select any of the tiles to drill in for further details. For example, selecting the top left tile will drill into the “Events by Resource Type” report. This report is one of six pre-built reports in this content pack. The other reports included are: Events by Caller, Search Events, Autoscale, Alerts, and Azure Health. After opening a report, you can interact with the different visuals and filters. You can hover over the visualizations to see details on the values or select a particular value to cross filter the other values on the page. The filter pane on the right can be expanded to change or apply any filters. Any of the existing visuals can be pinned to the main dashboard to customize it to your unique needs. You can add new tiles or move existing tiles to customize your dashboard. You can use the “Edit Report” option access the underlying data set, allowing you to edit or add additional visuals to your reports. You can also add your own pages, build charts and pin them to the dashboard too. After the initial import, the dashboard and the reports continue to update daily. You can control the refresh schedule on the dataset. 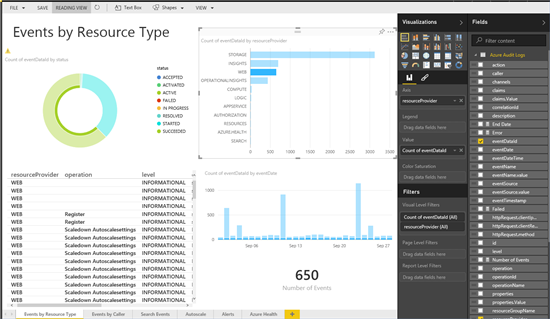 With the Azure Audit Logs content pack for Power BI, you can easily explore your data using the initial set of metrics and even building your own. We’re always interested in hearing your feedback – please contact us at http://support.powerbi.com to let the team know how your experience was and if there’s anything we can do better. We look forward to hearing from you!